When a meteorite causes an unexpected virus outbreak that infects the entire human race and turns them into zombies, it falls to the animals that survived to restore peace to the world. In Boost Beast, you play as Alec, the king of the dogs, who rallies an animal army behind him with which to exterminate the zombies for good. This apocalyptic match-three defence puzzler is as ludicrous as it sounds, with zombies lurching towards you in as many as 204 stages. To eradicate them from existence, the player must look to the puzzle grid in which the multicoloured faces of your surprisingly meek animal army appear. As the zombies aimlessly shuffle toward Alec, it’s down to you to move an animal block horizontally or vertically to match three or more of the same faces – success summoning the lumbering mammals to your side to attack the advancing hordes. If you let the zombies reach Alec, you’ll feel an intense pang of guilt as you lose the stage. Boost Beast starts easily enough, but you soon learn that certain zombies can only be defeated by specific allies. While grey zombies can be beaten with any animal, those of any other colour must be taken out with animals that match the shade of their decaying corpses. This complicates matters, and you’ll soon be fruitlessly sending allies of the wrong colour in a failed attempt to hold a wave of zombies back to buy you some time. The puzzler, which comes from Yoshi’s New Island and Hey! Pikmin developer Arzest no less, throws in the chance to create bombs that look to help throw the odds in your favour as the difficulty starts to ramp up – matching four blocks in a straight line creating a Cross Bomb, matching them in an L-shape making a Big Bomb, and matching up five blocks in a row concocting a Color Bomb. Players can also call on four Boost Monsters to help that can randomly generate a bomb or shuffle the puzzle grid, often rescuing you from a tricky situation. These help to clear the puzzle grid in rapid succession, turning the tide against the zombie hordes. But the greatest problem that Boost Beast has is how unpredictable and unfair it can be, resulting in situations where you are unable to overcome adversity with skill and leaving much of the experience to lady luck. The puzzle grid’s shape changes between each stage in Boost Beast meaning that honing your skill becomes a constant challenge, especially when rocks are thrown into the playing field that requires you to break them to clear some space. Combo chains can happen without any real planning, and, when the game doesn’t feel imbalanced against you, it can all seem too generous in that it plays itself – the player left perplexed as they are met with the score screen that tots up your zombie-bashing points, animal blitz points, and special block bonus. 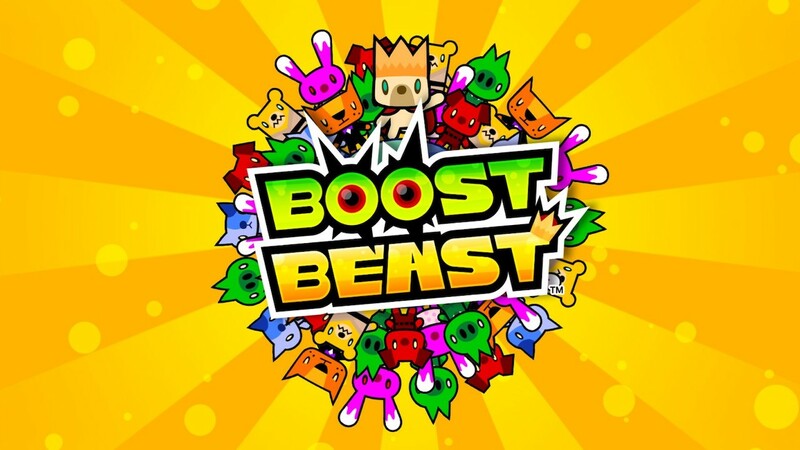 It didn’t come as a particular surprise that Boost Beast has origins on mobile as a free-to-start game. That not only shows in the grating arcadey music but that the port to Nintendo Switch has resulted in the game being boxed, with characterful, if basic, art sandwiching the game on each side. It’s not the best solution seeing as you will need to squint more in Handheld mode, but I’m not sure what alternative there would have been apart from overhauling the whole game. It is inconsistency and imbalance that cripple Boost Beast the most, which is a shame considering that it has some clever ideas. But, it squanders that potential, leaving it best to consider other puzzle fixes on the Nintendo eShop.